Really, it’s just that simple – a pirate needs a hat. It’s only a question of what kind. Some pirates may opt for the frilly, gold-trimmed variety that would seem suitable at the Governor’s ball. If that’s for you, then Captain Jack’s isn’t. But some pirates – indeed, MANY pirates – would seek a hat that’s ready for battle and pig-roast alike, a hat to protect the noggin come rain or shine, and that’ll look good while doing it. And as for the Governor’s ball? Face it mate – you’re not on the guest list. Captain Jack’s offers a wide selection of classical pirate styled hats. My own choice for this review was the Barbossa – it cuts a dashing figure that’s sure to impress the ladies. When first removed from the box two things struck me immediately – the hat was surprisingly rigid, and it was slightly tacky to the touch. Both of these are products of Captain Jack’s own wax/oil treatment, which Jack assures will stand up to the harshest of elements. He also assures that that tackiness and rigidity will both fade with use. Time will tell, but I can say right now that the treatment gives the hat a sturdiness that I’d never have expected from felt – I’ve no doubt it will prove to be one of the most durable pirate accessories I could ever hope to wear. And as for the hat itself – it really is a piratey thing of beauty. Handcrafted with the utmost care, it has a true sense of authenticity about it that transcends anything else in my collection. The only way it strays from this authenticity (and I believe this complaint would apply strictly to the Barbossa style hat) is its hatband, which appears to be a modern leather woman’s belt trimmed down to hat-size. 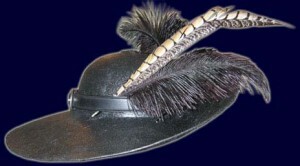 This, however, can be easily replaced – and in all other ways the hat could have fallen straight into your lap from the 17th century. Whenever ordering clothing through the mail, I always worry that the fit or the look won’t be quite what I’m hoping for. With Captain Jack’s, fit wasn’t an issue – he only makes one size. If it’s too small, he provides instructions on how to stretch it. And if it’s too large, wear a bandana underneath (which really adds to the comfort factor, anyways.) As to the look, my hat appears very similar to the one depicted on the website – but as is the nature of any handmade product, each hat is at its core a one-of-a-kind, with its own strengths, beauties, and quirks. Personally, I take great pride in knowing my hat is an original. It fits well and looks great. I’d say more, but we’ve really only just met – I’ll post a supplemental review in the future, after my hat and I have spent some true quality time together. Update: In my original review I mentioned the rather modern looking hat-band used on the Barbossa style hat. Captain Jack has since informed me that he now makes his own hatbands. He sent me one, and while it’s very similar in style to the old version, it’s rougher and more period. This subtle change nicely completes the look making for a hat that’s about as perfectly-piratey as allowable by law. To be fair, there is a reason Bilge has multiple Captain Jack hat reviews. There’s also a reason they get many stars. I’m just saying. I am a proud owner of one myself. It’s worth the wait, mate. Is there a tutorial on how to make the Barbossa Hat???? Andria, probably. I’d try YouTube.